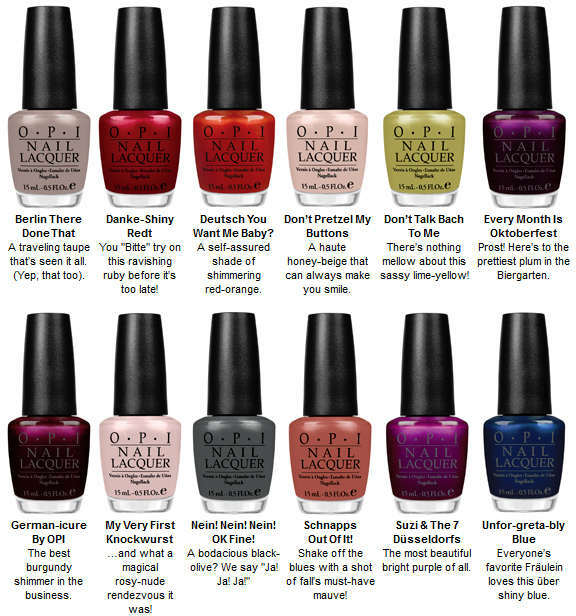 As OPI says: "OPI embraces runway trends with the Germany Collection for Fall/Winter 2012. Drawing inspiration from Berlin, an exciting new fashion hub that blends classic looks with the avant-garde, the collection’s twelve shades offer a mixture of vibrant color, urban-chic neutrals, and reds in variations from light to dark." Cherish the beautiful colors and variety; everyone will surely have their own favorites. And since OPI is free of DBP, formaldehyde and toluene, you can have that naturally gorgeous nails that stay looking fresh and beautiful for up to two weeks and your health is not at risk. OPI’s Germany Collection is part of Elite Nails' "New Arrival Nail Polish Collection" along with China Glaze’s Safari Collection and Orly’s Electronica Collection. If you want to more about this collection, drop by any of our branches now or call these numbers - 09336537276, 09215918801, 09178086950 or at (02) 480-6832. Or get yourself updated online via our Facebook fan page and at Twitter (@eliteNailsSpa) too.